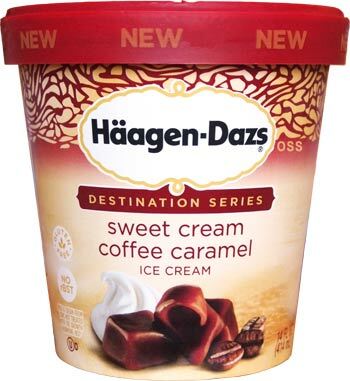 Where you attached to the Haagen-Dazs Artisan Collection? Well, those five flavors have been retired and in it's place we have 7 new flavors in the Destination Series. The good news is that they are just now coming on to store shelves. The bad news is that my first run only gave me two choices: Mango or Coffee. No, coffee isn't my thing, but several of you have already mentioned looking for this one in particular, so I'm going to give it a shot with two hopes. One, I'm sure it'll still be a quality product. Two, I'll pawn it off on my wife if it's too bitter or strong. There is a wonderful sweetness from the sweet cream side, but there's no denying this is a coffee flavor. It's quality ofcourse, and I always enjoy the texture and excellence of HD, but yeah, it's a coffee base. And the swirl? Yes, coffee times ten my friends. Oh sure it's a neat trick though with it's potent coffee swirly excellence. I mean that. I don't enjoy coffee but that swirl is one mighty beast. WOOOOOOOO. No idea where the caramel flavor is, but you won't care much. 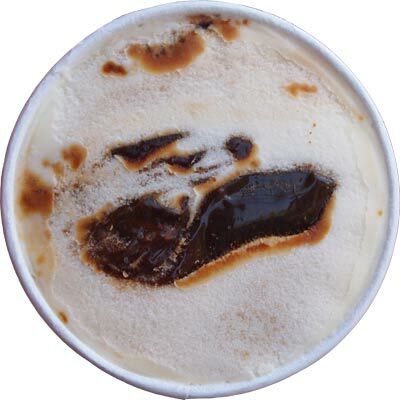 Whoa, so yeah, coffee ice cream enthusiasts should love this one. I don't even like coffee and I'm half tempted to grab some more of it. The excellent texture, the sweetness to the base, and that monster swirl come together to make a top notch product. Nice job HD. On Second Scoop: Now that the swirl is fading away and the coffee ice cream has become a bit more prevalent, I have to say, ya, I still really like this one. Me, Dubba, actually likes a coffee flavor. I guess there is a first time for everything. The problem with coffee flavors for me has always been just how omnipresent the coffee flavor is. It just wears me out way too quickly. The great thing here is that even though they have a true coffee flavor, there's enough sweetness from the sweet cream ice cream to finally give it a balance that my taste buds can handle. I just love the clarity of it all. You guys know I've been on an all natural ice cream kick, and factoring in the rich flavor that breaks down so easily on your tastebuds because there is no gums or stabilizers or whatever bogging things down, I just really enjoy this one. A lot. This is what ice cream is meant to be. Keep your eyes peeled for this new series, I have a full list of flavors and descriptions here. Final Scoop: While I must report that the swirl died out well before the end of the pint, I have to say, it's weird to finish a pint of coffee ice cream on my own. I guess there is a first time for everything! Well played HD, well played. BAHAHAHAHAHA! I did get a whole lot of swirl on my first serving! It's actually mango sorbet that they have (in the bluish container). Neither excited me, but mango ice cream might be more fun than mango sorbet. They had/have had the mango ice cream for a long time. I used to make ice cream sandwiches with it and white chocolate-macadamia nut cookies. So good. Doh! My bad! Thanks for the correction! It's been gone for a few years right? I see a few reviews, seem to be in 2010, 2011... 2013 too. Sound about right? I finally saw this at my grocery store; just have to wait for it to go on sale! The pint looked smaller than I remembered HD being. I picked it up and saw that it's only 14 oz now. HD kinda snuck that one in on buyers. Thanks for reviewing this one so quickly Dubba; glad you enjoyed it. Totally aggravates me too. Even though as was said its been like that for a while. Their ice cream is about on par with B and J and there is no reason to play such devious games. Making a 14 ounce pint? Changing to 3.5 servings? Really? Just reaks of corporate bean counters testing how much they can get away with. The joys of getting older! It feels like Ben & Jerry's is the only major company left that hasn't shrunk their packaging. There may be others, but even Magnum did it this year. A few of these flavors already existed a few years ago, so I kinda feel cheated. Years ago (In 2007, I think), they had the "reserve" line and they had a Toasted Coconut Sesame flavor. The Belgian Chocolate is served in pretty much every Haagen Dazs store, as is the brownie one, and the mango one is old news. But the Vanilla Tangerine Shortbread flavor looks like it'll be great. I wish more brands would use orange in their ice creams. I hope it's good! Yeah, when Marvo found the first couple of flavors, I was curious because 2 of the 3 he had found were originally scoop shop flavors like you said, so I wasn't sure what was up. however, I am forever in favor of anything that is an excuse to put brownies in ice cream. Definitely looking forward to the shortbread one as well. I don't have access to a scoop shop, so I am excited to try all of these flavors, new and old. I have tried four so far. The Belgian chocolate is lovely - so indulgent. The sesame brittle is unique and delicious; I just wish I could taste more of the cardamom. The vanilla tangerine is like a sophisticated creamsicle. I think the tangerine is better than traditional orange. And the mango is so authentic. It tastes like Costa Rice in a (almost) pint. I have tried all of the new Ben and Jerry flavors. Fun, but not anxious to buy again. I would happily buy any of the new Haagan Dazs again. They are both unique and classic all at the same time. If you guys are looking for these new HD flavors at a store, you should use the flavor locator on the HD web site. They have updated it to include all of the new ones and it works relatively well! Some of the special flavors still just arent available yet at any store in my area, but it found this one! Dubba, you were so lucky with this. My faux pint had zero swirl and was all icy. I was so disappointed! 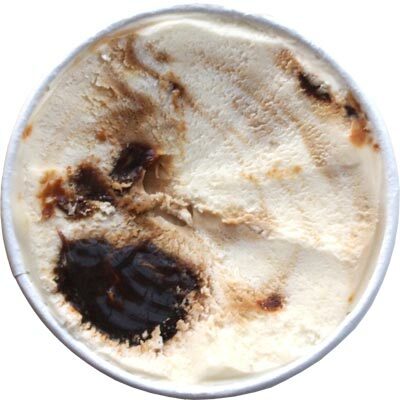 The only reason Dubba likes this coffee ice cream is because the coffee flavor is virtually nonexistent. That's the reality. 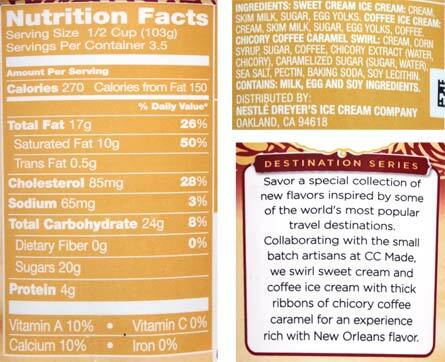 So yes, if you want to think you like coffee ice cream even though you really don't, this is the flavor for you. Actually, I think this may be the only time Haagen-Dazs has ever disappointed me. I felt like I wasted my money, and that has never happened with them before. Oh yeah, and the caramel was gone by the time I was about halfway through the pint. I guess they figure that if Ben & Jerry's can get way with that with their Core series, then they can, too. The coffee flavor is definitely there, and it marries oh so well with the sweet cream and chicory caramel. The hint of chicory works to enhance the coffee flavor, and let me tell you, it's a mouth full of heaven. THIS IS MY NEW FAVORITE ICE CREAM!!! Reminds me of a flavor Edy's made for their Starbucks line years ago called Dark Roast Espresso Swirl. PLEASE MAKE THIS AVAILABLE PERMANENTLY!!! 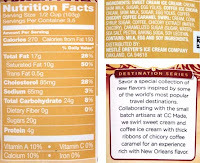 Tried the sweet cream coffee flavor - too mild on the coffee and the swirl of chicory was only on the top. Moved onto the vanilla tangerine shortbread flavor - tangerine flavor was barely discernible. Two disappointing new flavors, won't try the others. Coffee is and has always been my ice cream flavor of choice. This particular combination of coffee with sweet cream and caramel has become my favorite of all time. I can hardly stop once I've started in on a new non-pint, and then I just want to go to the grocery and buy some more. I do wish the swirl remained as rich all the way through to the bottom, but it is decadent and wonderful nonetheless. Thank you Haagen Dazs. The absolute best flavor ever!!! !